The large pear-shaped crystal is accented by smaller brilliant cut rhinestones. 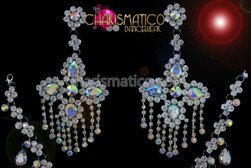 The rhinestone chains form the framework for a very fancy chandelier style drop. Meant for the true diva, not everyone can pull off this look, can you?